College students often have a pretty poor understanding of admissions processes. In the absence of any real information, it’s easy to let stereotypes and biases inform beliefs about how any individual student got into college. A student of color, then, may be viewed as less-deserving of admission regardless of their grades, test scores, and extra-curricular activities. More perniciously, they may question their own qualifications for admission, even when they have significantly out-performed their white peers. Your institution accepted you because they thought you could succeed. Period. You belong in college. Regardless of how you got there, you're there now - go do something with it. Self doubt relating to affirmative action has to do with how we talk about affirmative action. Not how it really works. Here's a suggestion: When writing about subjects related to race, don't use terms such as "the dark side". I'm female, not of color, but this is related: The most offended I've ever been was when someone said, "You're only in the computer science program to fill the girl quota." The issue is larger than 'just' self-doubt, because I had no doubt that I was perfectly qualified to be there. The issue is about fighting against active discrimination and pushback against affirmative action. If a refrain is common enough, it starts to be sung by your subconscious, a form of internalized racism (or in my case, sexism). Harvey Mudd College, famous for its former "1-to-pi" female-to-male ratio (that is, 3.14 men for every woman), recently admitted a first-year class that was 51% women. Some people were excited, but some people got quite angry about it. The main argument was "they're all going to fail out and our attrition rates are going to look terrible." I found it very offensive: Did they really not believe there were that many women in the world who were qualified to attend HMC, a tiny college of under 900 people? Didn't they know that the office of admissions wouldn't admit women who were underqualified? And then I suddenly understood affirmative action a lot better. For those who are interested, check out research by Madeline Heilman ( http://www.psych.nyu.edu/heilman/#publications ). If I remember correctly, she has also done some research on what people think Affirmative Action means, and how that affects their response to it. When AA is framed as, for example, preferential hiring, that bothers people a lot more than other forms of AA (e.g. recruiting workers from more diverse areas, providing training to help people prep for selection tests). I can't add much to the discussion except to say that I think the post is right as are many of the comments below that say that it has largely to do with how we talk about affirmative action rather than what it really is. Even in my case, as someone who does not actually qualify for any type of affirmative action policy, I can never escape accusations that I benefitted from these policies. Nor can many of my friends get over the notion that because they are white, they are at a disadvantage in getting what they want, whether it's a particular job, admission to law or grad school, etc. "Diversity hiring" is an all encompassing evil as far as they're concerned. I don't mean to make the issue about myself, but I do think my experience, along with that of many others here, speaks to the perception that affirmative action gives opportunities to those who do not merit them, and does so at the expense of others. Too often it's viewed as a zero-sum game. I think it's yet another reason why folks need to educate themselves about what these programs do and why they exist. These people aren't lacking confidence because of affirmative action. They are either lacking confidence because they don't understand affirmative action, or because of the treatment they get from students who aren't (or BELIEVE they aren't, believe being a very key word) affected by affirmative action. We as a society talk about affirmative action as if it's a "special treat" given to the great-great-great-grandchildren of slaves even if they do no work. In reality, it's a set of policies preventing discrimination, originally against people who were directly affected by the prejudices of the past, but more recently expanded to many other marginalized groups. We talk about it as if it affects only black people, when in reality it applies to most (all?) ethnic minorities, as well as women of any race. In fact, WHITE WOMEN ARE THE MAJORITY IN BENEFITS FROM AFFIRMATIVE ACTION POLICIES. This is in caps because it seems like this is some unknown fact, and because I find for some reason white women complain about it more than men. It's incredibly disheartening to read such an article like this from Lisa, who is a college professor and has mentioned working in African-American studies before. Affirmative Action is NOT solely about white and nonwhite, and I pray to god for your academic integrity you have just written a lazy article here, and are not giving your students such terrible information in a class like the one you've claimed to teach. Are we really using PostSecret as a credible and representative source? The issue remains what affirmative action is addressing: The oppression of certain groups of people in society. I find the focus of this article extremely disappointing, to be polite, considering the progressiveness of Sociological Images. The article has missed where the focus should have been: That efforts to counter the oppressiveness runs beyond just the access into societal institutions such as Universities. It also has to do with how we, all members of society, continue to internalize and exercise oppressive practices in our outlook, analysis, and ways of being. As a graduate from an affirmative action program who has gone to earn a PhD and who now is a professor in a larger University, I understand that my early achievements were not hampered by cognitive abilities, but by societal constructs and practices adopted by those in positions of power and privilege. When I had self-doubt, it was more a reflection of people telling me that I can't do something and what I was "allowed" to do, than it did with what I was capable of achieving. I really have to wonder if it was a person of color who made that "confession" or if it was one of the white "bake sale" kids. I've erased my comment because of surprising replies. The internet is not anywhere to share feelings. Meredith Palmer, you got in to an ivy league on a full scholarship, and you graduated with a 4.0 and research honors. And then because you "got called" affirmative action girl at work "just as a joke", you wonder if sometimes it's true, and you know it [whatever it is] isn't suppose to work that way. Really?! Legacy preferences or legacy admission is a type of preference given by educational institutions to certain applicants on the basis of their familial relationship to alumni of that institution. (Students so admitted are referred to as legacies or legacy students.) This preference is most common in American universities and colleges and emerged after World War I, primarily in response to the resulting immigrant influx. The Ivy League institutions are estimated to admit 10% to 30% of each entering class using this factor. ...In the 1998 book The Shape of the River: Long-Term Consequences of Considering Race in College and University Admissions, authors William G. Bowen, former Princeton University president, and Derek Bok, former Harvard University president, found "the overall admission rate for legacies was almost twice that for all other candidates." While the preference is quite common in elite universities and liberal arts colleges, it is quite controversial, with 75% of Americans opposing the preference. So Meredith, is "it" supposed to work that way? "Your institution accepted you because they thought you could succeed. Period. You belong in college." Do you know that that's true for every single person in every college? Or are you just guessing? 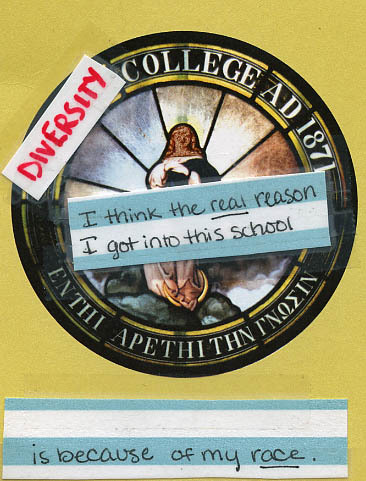 I really identified with this PostSecret. When I was in college, and right before I arrived there, a few people were pretty unhappy that I was on scholarship, which they thought I didn't deserve because of affirmative action--I am an enrolled member of an American Indian tribe. After receiving a B.A. and an M.F.A., I've still never gotten any final course grade lower than an A/4.0. I am an adjunct instructor and adviser at a major university. I don't really know what they wanted of me when they gave me that scholarship, but I delivered, and I'm only 26, so I've got plenty of book publications and other awesome things ahead. I teach American Indian Studies and if any student wants to talk about affirmative action with me, I encourage that student to focus his or her energy on dispersing that frustration--it's way better to think about one's own studies and potential than get wrapped up in some nonexistent raw deal.